This post is for beginner beaders out there! The flat spiral is one of the most rewarding weaves I ever did as a beginner. It sits well on the wrist and can be customized with different beads and color combinations. 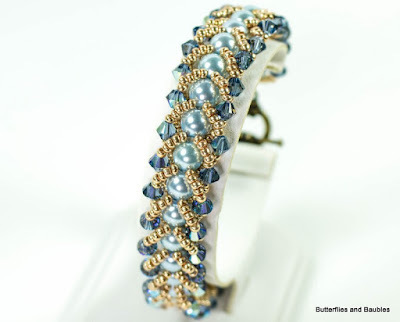 One of the loveliest combinations I have seen is Debbie of Butterflies and Baubles' easy flat spiral bracelet tutorial. Adding metallic seed beads really makes any beading project elegant! She uses 6 lb Fireline which is a good choice for bracelets. Fireline is very strong. I remember my mother using just sewing cotton for her first beaded earrings and the rough inside of the beads soon wore and broke said cotton! You can buy Fireline cheaper at either the fishing section of department stores or better yet, get it in bulk from a fishing store near you. Fellow members of the Grand River Beading Society where I am a member go to Kingsway Sport, Woodlawn Road in Guelph, Ontario. They sometimes run out of empty reels so save yours to take to a fishing store just in case. It always amuses me that the store has two kinds of customers - those who are clearly the outdoors type and those who come in wearing pretty beaded jewelry! If you want colored Fireline, check out SparkleSpot - I wrote about this store some time ago (note the giveaway is over). Thanks Val for letting me know. I have corrected the link. Have fun!